At the beginning of the year and after quite a bit of research I purchased a KJV Ryrie Study Bible. 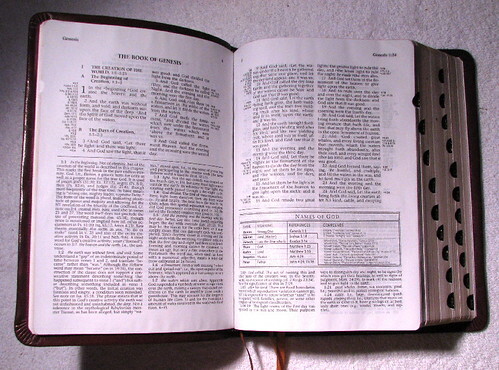 I had decided that there was no way I was going to be able to locate a study Bible that I liked that was also bound in a way that was pleasing to me as I have a very specific set of things I like in a binding. My idea, although not yet fully formed, was to find an edition in which I was satisfied with the study tools and to later have it rebound. 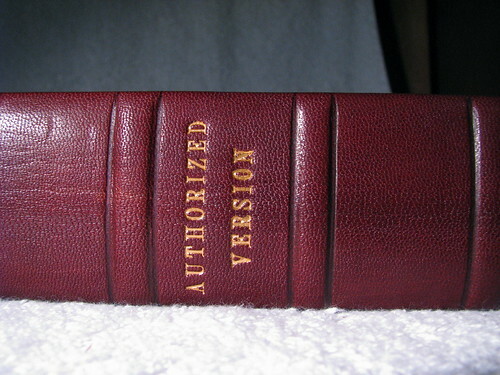 In spite of this I decided to go with the "genuine leather" edition offered at the Bible shop because I was not sure how long it would be before I would get around to having it rebound. It turned out that the "genuine leather" was a very cheap, thin leather that had a hard plastic feel that was unpleasant to me. At about this same time a ran across your blog and was exposed to some of the superb rebindings your readers were having done. In particular I was struck by an ESV that Matt Morales had rebound by Paul Sawyer. I wanted a Bible that stood apart from those that come off the shelf at Christian book shops, something with a antique European feel to it. I sent an e-mail to Paul with a very specific list of features I was looking for in a binding, in his reply he said that he could (and would) do everything I wanted, so I packed my Bible and shipped it off to him at once. 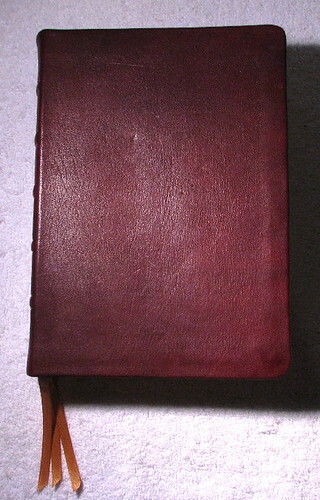 Paul bound my Bible in a natural Russell's Nigerian goatskin leather with a light patina added to it. Although this leather is a little thicker than what would normally be used on a Bible and thus a little less flexible, that thickness adds to the antique look and feel I was going for. That said it is flexible enough and I can tell that it will become quite supple with use. Paul used marbled brown silk endpapers, this was something I was not entirely sure I would be happy with, but the end result is very pleasant and again adds to the vintage appearance I had in mind. I also had him add three gold ribbon markers as the two in my old Cambridge Bible never seemed to be enough. On the spine Paul added five raised bands and put an indented line on either side of each band, which was something I would have never thought to ask for. 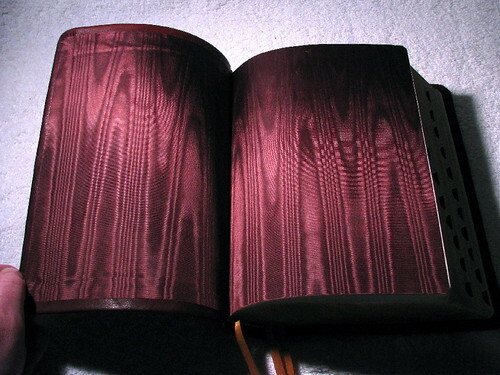 This highlights the raised bands very well and gives the Bible an almost medieval look. For the gold stamping I asked for a Roman typeface that had an old fashioned look, I feel that he did a good job of selecting the type. At the top is "HOLY BIBLE" in the middle I opted for the more traditional "AUTHORIZED VERSION" rather than"KING JAMES VERSION." At the bottom of the spine I had a request that I thought Paul might not agree to, I learned from his website that he used to own a bindery in London called "Lakedale." For some reason I was really fond of that name, it sounded pleasant and to me suggested a bookbinder operating in a quaint little English village not yet touched by the Industrial Revolution. 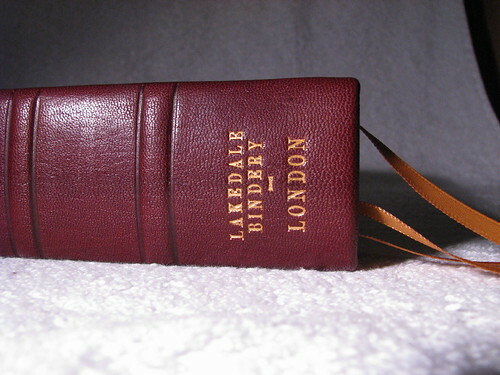 To my surprise Paul agreed to put "LAKEDALE BINDERY - LONDON" at the bottom of the spine. I have found Paul Sawyer to be very pleasant and willing to bend over backwards to give his customers just what they are after. 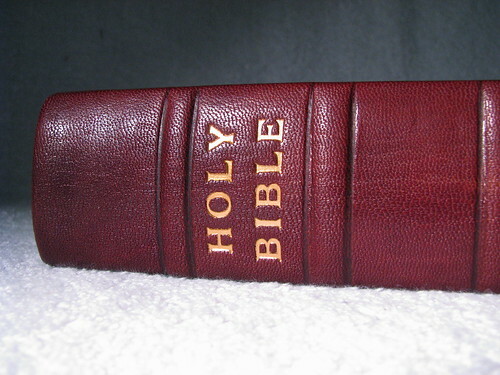 He is also very fast, I put this Bible in the mail on 29 January and got it back on 08 February. He is also quite a talker when you get him on the phone and it is clear from talking to him that he loves his craft. In order to give a balanced review I feel that the negative aspects should be included along with the positive. However, I can not think of a single negative thing to say about Paul or the work he did on my Bible. Thanks for the photos and the review, Michael. 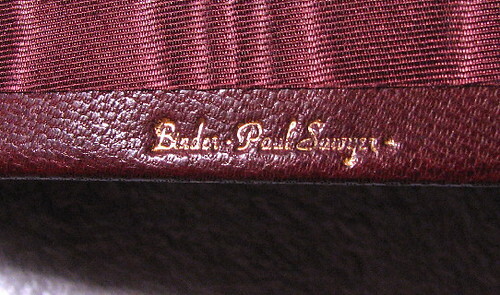 It certainly whets my appetite to have something rebound by Paul Sawyer -- perhaps the upcoming Personal Reference ESV? For those of you who feel the same, you cane contact Paul Sawyer via his website: www.sawyerbinder.com.